This beer has been a bit of an ordeal for me - mostly because of the risks involved with spontaneous fermentation. At first, when this culture started fermenting it threw off more sulfur than I've ever smelt from a beer before. The noxious gas I sniffed from the airlock within the first few weeks had me second guessing my choice in this foray into the great unknown, but I held stubborn to the beer anyways. The thing about sours, and especially sours wherein you forego the commercial cultures, is that you can't tell how the beer will be after 8 months, or a year, or 2 years. This one was an adventure in testing my blood pressure. When I first pulled a sample of this beer, it tasted... okay I suppose. The first taste was great, mildly tart with some lemon, funk and minerals. The aftertaste, however, had a nasty phenolic burnt rubber sort of taste that had me worried. I would go for a second sample and I wouldn't be sure I tasted it at first, but it wasn't sitting right with me. At the 12 month mark, it seemed to have cleaned itself up, and was tasting quite delicious. The beer at this point was tart with some really great flavors that reminded me of some commercial sours. I was confident that this spontaneous fermentation was a huge success! 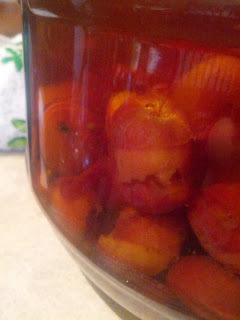 I decided to split this beer into 2 smaller carboys and age one half on crabapples, and one half on apricots. Unfortunately, not long after that I took a sample after a month on the fruit and that rubbery nasty flavor was back. I was obviously a little bit disappointed at this point.. I thought I was prepared to brew a dumper beer when I made this, since the wild fermentation can result in some nasty flavors if it doesn't turn out, but I was still pretty upset about the nastiness that came back. "Let it ride!" I reminded myself, and left it for a few more months. After a while, the crabapple portion cleaned up nicely, so I bottled it, and here we are several months later now that the carbonation has settled and the THP cheerios flavor has faded. When I bottled it, the crabapples in the bottom of the carboy had disintegrated into a apple-sauce consistency. Unfortunately for this beer's sibling, the apricot portion is still iffy. The apricot portion seems to be cleaning up, and I plan to pick a bunch of apple blossoms in the next few weeks and use them in the beer to see how that treats it. Appearance: Very light! It was brewed with 50/50 raw wheat and 2-row with a single decoction, so it seems to be holding up a very classic look. It was exceptionally clear as well. The head frothed up quickly, but died just the same before I could get a good picture. Aroma: Lemony, musty, a hint of bubblegum? A bit mousy, and some lighter citrus funk flavors - more pissy than barnyard. Flavor: Pleasantly sour, definitely sour but not really assertive nor lacking. The acidity is interesting because you can tell the mixture of lactic and malic acid. The acidity is very reminiscent of biting into a green apple. Leather flavors, and a hint of oak. A touch of grain in the finish. Mouthfeel: Puckering, but not extreme. A bit of tannins from the oak or from the crabapple skins help to dry out the mouth and give it a great dry finish. Spritzy, prickly carbonation. Overall: Yup. Mhmm. I'm very happy with this one. I wish I had some more sour beer geek friends to share this one with. I'd love to have some more opinions, because I think this is great. I wouldn't mind a touch more acidity, or even a bit more earthy brett funk rather than the light stuff. The bubblegum notes are interesting, I wonder if I caught an interesting yeast strain for that. I used the cake from this batch after the split to innoculate the "lambic-style" beer I brewed in Fall 2014. It threw off the same nasty sulfur compounds and has the same weird rubber notes that I'm starting to assume are a kind of quirk of this new wild culture. It seems to clear up and get good after some age, so I'm much less concerned for the next go around.